A RELATIVELY quiet Tour de France beginning, in the racing sense, opened hopefully for Britain when Michael Wright just missed taking the yellow jersey right from the start, with a sensational sprint that left the cream of the world's sprinter roadmen behind yet just failed to get past Edouard Sels, Solo-Superia's stop-gap sprinter. It was just as well that Sels was there, for half a mile behind him his boss, Rik Van Looy, lay groaning by the roadside - semi-conscious, his Tour ruined from the start, when he was heading for an almost certain first-day victory. Wright, making his debut in the Tour, was with a leading bunch, and got well clear on the hill-finish at Lisieux, attacking hard behind Sels whom, he said, but for the hill he would have beaten. The Belgian champion rode through the second day at the back of the bunch, directing his team's riding, for which he was awarded the "brains and legs" award of the day, but was unable to start on Wednesday when, after rising and eating a couple of biscuits, he was once more seized by the vomiting which had affected him since his accident. Heavily concussed, unable to sleep except under sedation, unable to keep food down, he was carried away in the ambulance. For the next few days the Tour was fast but without any outstanding breaks, the field finishing bunched most days ; and the absence of Van Looy's attacking became more and more obvious every day. Yellow jersey succeeded yellow jersey, with Van Looy's team holding the emblem for the first four days : first Sels and then Vandekerckhove. Then, out of the blue, came a renewed Rudi Altig - refreshed and ready for battle, and encouraged by his first few days' riding. Rudi took the yellow jersey just before the Tour entered Germany, reckoning shrewdly that he would have no chance of winning a stage in his own country at Fribourg, but that it would be good to take the green jersey of points leader into the Rhineland. He did better, and took both the yellow and the green through Germany, finishing second at Fribourg to the Belgian Derboven in a disputed sprint. With Anquetil unwilling to do anything but follow, the rest of the race was left to its own resources Simpson remained sagely in the bunch, while Denson and Hoban, the service men of their teams, had to go backwards and forwards at the beck and call of their leaders. Barry Hoban crashed and punctured, and lost a lot of time; Vin Denson broke his frame and lost a similar amount, but managed to make up in part by taking the third place on Sunday's stage behind the two sprinters, Jan Janssen (H.) and Willy Bocklandt (B), showing that his legs were good if his luck was bad. Alan Ramsbottom was unable to start owing to a team dispute, which kept him out of the Tour for having failed to turn up for the Tour of Luxembourg. Simpson took up cudgels on his behalf, but though he had many heated words with Alan's team and his manager, nothing was done and the unfortunate Lancashire rider was out of what Tom called "the biggest money-maker of the year". THE great Federico Bahamontes proved that, even at 36, he has the best pair of climber's legs in the business when, on the 8th stage of the Tour de France, he simply dropped everyone, including Poulidor and Anquetil, and stomped away over the Alpine passes to a stage win in the old style. Yet, even though the old Spanish master showed his form, and even though Jacques had a bad time of it on the slopes of the Galibier, spewing violently through the effort and through the ice-cold drink he had taken, the Norman still forced himself to come in less than two minutes down on the Eagle of Toledo. Shaken by this set-back, Jacques surveyed the situation calmly. "I always have a bad day on the first climb," he said, "and now I know that I have got the Giro, out my system." More concerned was he about the fact that Poulidor, last year's Grand Prix des Nations winner, was ahead of him on general classification by one and a quarter minutes. The sober Raymond had not tried to match "Baha” pedal for pedal, but he had romped home to a second-place bonus. Tom Simpson, too, had been surprisingly quiet in the Alps, both he and Anquetil appearing lower down than their fine climbing would suggest. For both had climbed well, and both had punctured at the vital moment. What had they in store for the race followers? They had the finest sprint of race up to that point, when the pack of 22 riders swept down from the highest point of the Tour, the 9,000-feet Col de Restefond, where inevitably " Baha " had raced over the top first, amid spectators standing on piles of snow. Experts thought that Simpson, with his track experience, might have won this stage finish at Monaco: but the wily Anquetil, getting on to the track first - a cinder track - just stayed in front all the way. Simpson tried his hardest to get by, but on a good day Jacques is hard to beat, and he simply fought off Simpson in a very close finish to take a minute's bonus back from Poulidor, finishing just behind him in the bunch. 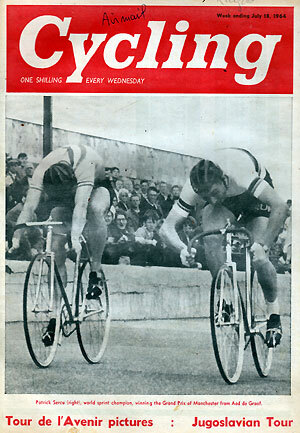 But Simpson had showed he was on good form, and this was satisfying to the British race-followers. Next day, a relatively flat run to Hyeres Michael Wright, too, showed that once out of the mountains he -can hold his own with anyone. 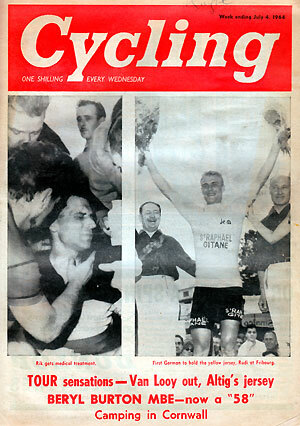 It took those two master sprinters, Altig and Janssen, the latter running him a bit roughly as well, to beat Michael in the sprint, which preceded the first individual time trial. Only 13 miles, but what an unlucky number for those who had to match their speed against a now flying Jacques! Remember what he said in CYCLING last week: "Let me get to the sunshine in the south." And once there he really flew. He explained afterwards that he wanted to see how good Poulidor really was, before the long time trial (Thursday, July 9). In 13 miles the great Frenchman took 36 seconds out of Poulidor: 54 out of Altig; 1m. 7s. out of Bracke (1962 G.P. des Nations winner). 2-40 out of Bahamontes, 3-11 out of Groussard, who yet kept his yellow jersey, and 2-40 out of Simpson, who finished 20th, three seconds behind Vin Denson. But the details didn't matter. What did matter was that at last Jacques had laid his cards on the table. There was to be no win for Poulidor - at least, not an - easy win without a fight with Anquetil. Simultaneously, the hopes of the other riders faded as Anquetil, visibly stronger now than when he started the Tour, put a tight hold on the race through his ultra-strong team. There can be little doubt now that, failing accidents, Jacques Anquetil is going to become the second man in history. to win both the Tour of Italy and the Tour de France in one year. To beat him, he must be attacked; yet if he can't be got by, then he will walk away in the two time trials to come, even in the last one in to the Pare des Princes. 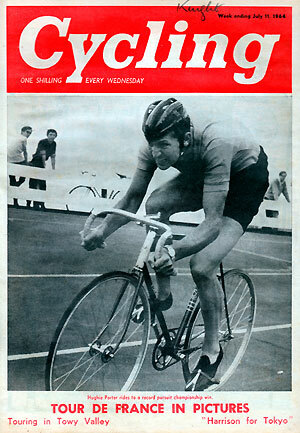 Nevertheless there is money to be won in the Tour, and Alan Ramsbottom must regret bitterly not being with the flourishing Pelforth team, which right the way from the Alps to the Pyrenees held the yellow jersey and the team lead as well, and fairly coined money. Michael Wright proved that even after a stiff time trial he still had a good gallop. On the day following, the whole bunch came in together, and again it was Ed Sels who beat our Mike to the line, but they were the only ones who didn't need a photo finish. After that lot he still expressed his feeling that he would be on to a good one (see page 19 for comments), and it was evident that from the British point of view, this was not going to be a Tour of falling by the wayside. This lot in the Tour are hardened men, who will not be put off by heat or tough conditions, and who can stay with a bunch. And they had to stay. In sweltering heat on Friday, Jo de Roo was sent off by Anquetil to make it hard for the others preceding the Pyrenees. Make it hard he did, after attacks by Seamus Elliott and Pierre Evefaert had not quite come off. Result - through the first day in the Pyrenees, up the Envalira, a new untried mountain, only Jimenez, a Spanish climber, could get away, though by nine minutes; and the bunch, tired from chasing Anquetil's men the day before, all came in together, including even Benoni Beheyt, who won the sprint for second place. So, more Pyrenees climbing to come, then a time trial, and then - wait for it - Bahamontes says he will win the Tour on the Puy de Dome, when the race reaches Clermont Ferrand on Sunday. Up those steep slopes he intends to break away and gain a lead large enough to ensure him victory. Poulidor has said similar things, but what have Jacques and Tom in mind in the meantime? PERHAPS one of the hardest-fought Tours de France of modern times. certainly the hardest that Jacques Anquetil ever fought, entered its third week with the whole bunch seemingly together, but with huge cracks appearing in the facade of strength. Tour de France, though he felt like packing it in halfway through. quarters of an hour and go on to take a huge lead. But Jacques Anquetil dealt this year in seconds. Imagine the feelings of a racing cyclist who had defended a half-minute lead all the way up the Italian peninsula, only to be presented with a worse situation in the last week of the Tour de France! For, when this great rider in a time trial finally took the lead he had only 56 seconds in hand over his deadliest rival, the flying Raymond Poulidor truly riding the Tour of a man possessed - who was still, after 18 stages, the favourite of our own Barry Hoban, riding in support of him and well placed to see his strengths and weaknesses. After 20 stages Poulidor lacked only 14 seconds! As day succeeded day the Tour, which had started with the big bunch sprints, with the whole race keeping together, became more and more an individual battle between the heads, linked together in a fight over seconds. And while the big men watched one another, the smaller team, the team that Alan Ramsbottom would have been with had he ridden, stole everything, maillot jaune. points lead, team lead. Little Georges Groussard became everybody's hero, and looks like having plenty of contracts from today on. George, who had done nothing much as a pro except his duty, hung on; so much so that his manager was openly saying after six days - " if only we had let Georges have his head on the way to Fribourg " - thinking of the lead that the courageous Georges had got. First Poulidor. then Bahamontes, then Anquetil all made their efforts, but nobody seemed to be able to make the decisive jump which would put him out of jeopardy. British hopes, so high while Tom Simpson stayed up with the top men, just had to drop with him when the blazing, pitiless sun of the Pyrenees caught up with him and, suffering from heat exhaustion, he lost a whole armful of minutes in one day's racing, and had to say goodbye to his hoped-for Tour win, for this year at least. Poor Tom, but at least he had been in the Tour de France which had seen more success by British riders than ever before. This was a Tour when any day a British rider, and one of two or three at that, might pull off a win, get first over the line even in those bunch sprints that make the Tour so spectacular. That Anquetil was able to fight off the bad days, and force himself to ride in a way he had never ridden before ; that he was able to throw down the gauntlet of defiance openly after a mountain stage and say " see if they can beat me in a time trial," speaks volumes for the iron nerve, the cool mind of the Frenchman. Sticking our neck out, for after the climb of the Puy de Dome he only had a 14-seconds lead, let us say, as we write on Monday morning, that Jacques Anquetil has won the Tour. Day after day he produced the necessary efforts to keep him up with the climbers, the sprinters and the tough men, even though these attacked hard, sensing that this Anquetil was weaker than the man they had met before. But it has become obvious that whatever Jacques lacks in sheer dominating speed against the watch now - and this is only relative to Poulidor, the others are still outclassed - he has gained in the science of stage racing. And he is sporting, too. When Poulidor had lost two-and-half minutes through an unfortunate accident, and made it up next day with hard riding, Jacques was the first to recognize that this was really only justice. Poulidor had buckled a wheel. His manager suggested a change. He stopped, the mechanic changed it, and pushed him off - literally ! Picking himself off the floor, Raymond hoisted a leg over the saddle, and pedalled - on nothing, his chain was off! This incredible series cost him 2-34, and perhaps the Tour of 1964. But it is this kind of mental agony which makes the Tour the greatest sporting event in the world, each day full of incident, any day a• possible winning day for the man who dares to try. And this year, above all, the men have dared to oppose Jacques Anquetil in the best manner possible, with legs turning. as fast as possible, as often as possible. But as the onlookers were pointing out when the race reached the vital Pyrenees. Jacques had raced on 39 out of the last 60 days, and that was a lot. What a man, and what a race!